Object Journeys is a new three-year partnership project at the British Museum. Generously funded by the Heritage Lottery Fund the programme will see the Museum support and collaborate with community partners to research and explore ethnographic collections and to work directly with staff towards a gallery intervention in response to these objects. Object Journeys is an exciting opportunity for community partners to intimately work with the collection and for the Museum to draw on the experiences and knowledge of individuals within different communities. Building on the momentum of past projects like Sikh Turban Fortress and Talking Objects it is also about trialing new and evolving engagement methodologies and experimenting with community-led display development approaches. Over the three year life of the project there will be three projects at the British Museum in London and we will support three of our partner museums in the UK to run similar projects in their institutions. Our first year partner is Manchester Museum. Trying out Somali head rests in the Museum’s handling collection. Head-rest. 19th-century, Somali, British Museum Af1933,1114.16. The first London based Object Journeys project in 2015/16 aimed to explore the Somali collections at the British Museum. They worked with 10 young adults from the London Somali community to explore the Museum’s Somali objects, many of which are not on display, in order to uncover new knowledge and tell new stories at the Museum. From exploring and researching the objects in the Museum’s stores and archives to the brainstorming of potential display case themes, to setting up social media accounts and identifying wider members of the Somali community to get involved, the group worked closely with staff to conceptualise and develop their display at every stage. Exploring the conservation laboratories in the WCEC at the British Museum. Somali culture and tradition are areas most people don’t know very much about. To some, it may even be unheard of. Taking part in the project was an opportunity to promote and showcase these very aspects of Somalia that the public are otherwise unfamiliar with, by using the British Museum’s collection of Somali objects. In my view, there is no better way to achieve this than through this medium as each individual object will tell a unique story and represent different aspects of Somali life, culture, and tradition. I also admired the fact that the Museum sought to create a display of Somali objects by involving young Somalis like myself to have a say and have a first-hand interaction with the Museum and its collection. With this in mind, I hope that the project creates a platform for Somali communities or any community for that matter to connect and interact with the Museum in a way it hasn’t done before. Moreover, I hope that the project creates a display that’s unique and is different from displays the Museum has done before, in that it is perhaps more interactive and engaging to visitors through the use of more creative and inventive methods of display. My upmost ambition is to shed light on Somalia’s vibrant and fascinating culture. I feel that taking part in the Object Journeys project can present a different story. I don’t believe that an object alone can tell the story of Somali culture, as cultures are dynamic and a collection of objects can only reveal so much. However, the process of curating with groups like ours can challenge the narrative of colonialism often surrounding large museums like the British Museum. Firstly, through detailing the objects in a way that demonstrates how the objects originally came into the hands of the British Museum, I feel we can explore the institutions’ collecting past in a frank manner. Secondly, the involvement of sections of the British Somali Community in the process can strengthen the exhibition in bringing our knowledge of the objects and stories behind them directly to the Museum and its visitors. The Somali Object Journeys project culminated with a display at The British Museum during the summer and autumn of 2016 and an accompanying programme of events. The next Object Journeys partnership project is being run in collaboration with Manchester Museum. 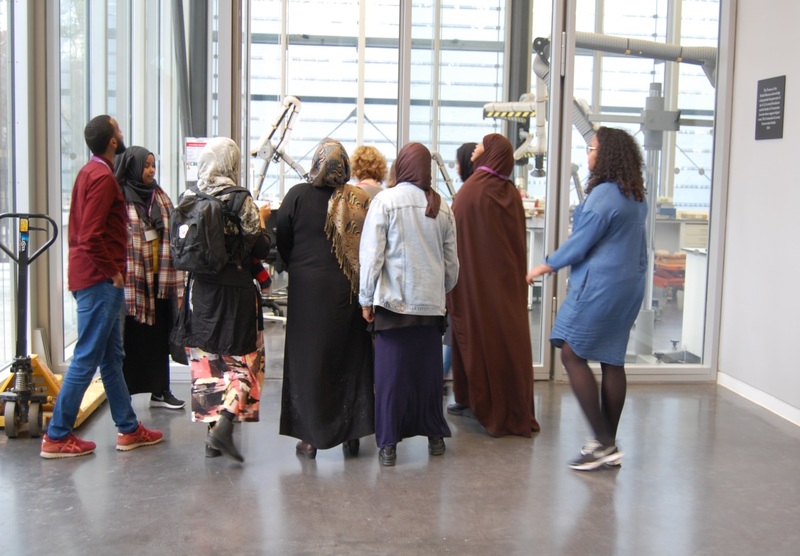 Manchester Museum is working with an intergenerational women’s group from community organisation Communities on Solid Ground to explore both their and the British Museums South Asian collections in particular Pakistani textiles and jewellery. Embroidery and traditional textile adornment techniques have been specifically interesting to the group and they have chosen three Pakistani textiles from the British Museum to be showcased alongside objects from the Manchester Museum collection in a co-created display at the Museum in early 2017.